Bridlington is one of Britain’s oldest seaside resorts and has been attracting visitors ever since the fashion for sea-bathing became popular in the first half of the eighteenth century. Soon, wealthy people from across Yorkshire and beyond arrived with their families to stay in and around the Quay and numbers increased after the main roads to Bridlington were turnpiked from the 1760s. The summer influx of visitors were accommodated in local lodging houses and inns or else rented villas. In 1766 an assembly rooms was opened to cater for the thriving social scene and by the early 1800s the first theatre had been opened. In 1846 the first railway reached Bridlington and soon thousands of people living in the growing towns and cities of northern England and beyond could visit the resort. Initially, many of these new tourists came on day rail rips or excursions but later the numbers coming on holiday for a week or so increased. In the 1860s the Sea Wall Parade was opened, old properties were bought up and many new building plots provided. In 1896 the People’s Palace opened on Quay Road as did the New Spa but both had chequered histories. The People’s Palace was converted into an early cinema in 1911 whilst the old Spa burnt down in October 1906. By the Edwardian era the resort had been transformed and acquired many of the buildings that we can see today. 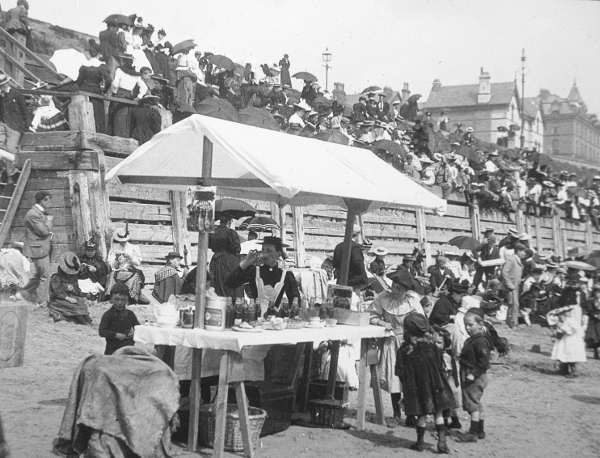 Although the destruction of the spa was a setback it was replaced in 1907 by a much grander building which continues to grace Bridlington’s modern seafront and provides a venue for events of national and international significance. 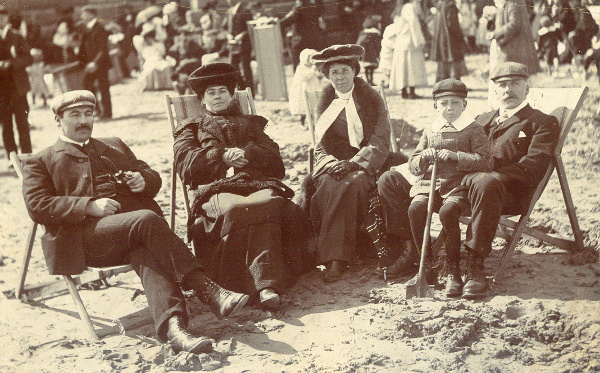 After the Great War Bridlington’s tourist industry rapidly revived and continued to enhance its provision. The new spa hall, opened in 1926, proved particularly popular and, as the historian David Neave has shown, by 1921 the resort was already placed in the top-ten of English and Welsh resorts in terms of numbers of visitors. Bridlington grew rapidly, its expansion fuelled to a large degree by its increasing popularity as a holiday resort as well as place of retirement for Yorkshire business people. The acquisition of Sewerby Hall, Danes Dyke and Flamborough Head by Corporation in the 1930s provided a host of new attractions. The development of road transport boosted the number of visitors with many now arriving by way of cars, motorcycles and charabancs. Many week visitors and the like stayed in apartments although the numbers using boarding houses of hotels increased during the 1930s whilst others stayed under canvas or in caravans which became particularly popular after the Second World War. Fortunes soon revived after the return of peace in 1945. Bridlington boomed during the 1950s and early 1960s thanks to a combination of growing affluence and increasing car ownership. Large numbers of holiday makers came for a week or more whilst countless thousands of day trippers continued to pour into the town by train or car, lured by sea, sandy beaches and popular shows as well as the harbour and surrounding attractions. Although the resort, like many others in Britain, suffered a decline after 1970 thanks to the sharp rise in the popularity and availability of overseas holidays, Bridlington has markedly altered its offer in response to changing visitor requirements and has not only received its fortunes but has maintained its position as one of the UK’s leading holiday resorts. Surfing was first brought to England at Bridlington by two Hawaiiaan Princes. In September 1890 HRH Prince David Kawananakoa and HRH Prince Jonah Kuhio Kalaniana'ole, brothers and nephews of the ruling King and Queen of Hawaii HM King Kalakaua and HM Queen Kapiolani, had come to England to study. Their college tutor John Wrightson, a Yorkshireman, brought them to the seaside during a break form their studies. They rode the waves in Brildington Bay surprising the local people, thereby introducing the ancient Hawaiian sport of surfing to these shores. Soon Wrightson himself learned and enjoyed the sport. It is believed the Princes had their surfboards cut and shaped to their own specifications by a Bridlington boat builder.